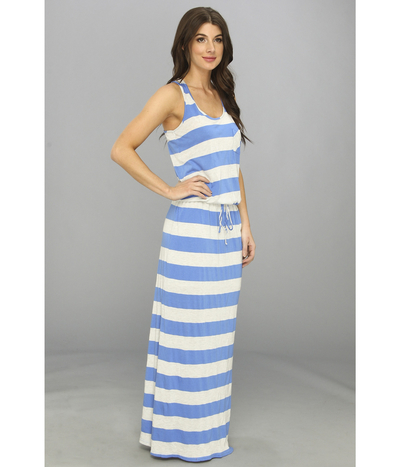 Maxi dresses have been staples in many stylish gals' closets for many decades now. These flowing dresses are more popular than ever in 2016, however. Women everywhere are looking to make maxi dresses part of their wardrobes. Although these dresses are carefree and casual, they still manage to look effortlessly elegant and attractive. The Swank Store's "Aruba" is one of the most exciting maxi dress options of the year. It features adjustable shoulder straps and has a heavy Caribbean influence, complete with beautiful yellow, white, turquoise, blue and purple colours. This sultry dress also is equipped with crystal ornaments that make it truly irresistible and memorable. It's ideal for both daytime and nighttime wear. Felicity & Coco has a lovely woven piece that's one of the most eye-catching maxi dresses of the entire year. This navy blue dress is equipped with slender straps, a V-neck and an empire waist that can help make any physique look more lithe and streamlined. If you want to wow everyone with a classic look that also happens to be wonderfully beachy and casual, this Felicity & Coco dress may just be a big hit for you. NC International Concepts is a popular apparel brand that's known for its sleek and cool city looks. If you're interested in embellished maxi dresses, you'll surely fall in lust with INC International Concepts' exciting offering. Some highlights of this sleeveless spandex and rayon creation are a flirtatious halter neckline, shelf bra lining, pullover styling and a handkerchief hem. If you want to walk around looking sophisticated and chic as can be, this INC International Concepts dress may just be a wonderful low-key day style for you. The front of the dress features embroidery and hand-beaded designs that help make this piece genuinely unforgettable and inviting, to say the least. Diane von Furstenberg is an internationally acclaimed designer that's the epitome of fashion. If you want to rock one of the coolest, most interesting and most compelling maxi dresses of 2016, the designer's silk zen scarf option may pique your interest. The dress features a V-neckline that's ideal for women who want to look both alluring and classy. Other noteworthy components of this dress include its straight hem, banded waist, snake-influenced trim and traditional A-line silhouette. If you want to feel cool, chic, vibrant and perhaps even a little exotic, this Diane von Furstenberg dress should definitely be part of your wardrobe for 2016. C&C California has a racerback dress that's perfect for women who want to look confident, cool and truly put together. This maxi dress blouson maxi comes with a side slit that's the ideal combo of refined and flirty. Other standout elements of this C&C California cotton dress include its drawstring waist, its chest patch pocket and its lovely U-shaped neckline. The dress has a length of roughly 60 inches beginning at the shoulder and ending at the hem. If you're a big fan of casual and easy slip-on attire, this C&C California outfit will definitely catch your interest.